Arriving mid-morning on a glorious autumn day, we were greeted warmly by Brenda, the guest activities director. It had been a long drive and, noticing our need for nourishment, Brenda quickly fixed us up with some treats from the kitchen before leading us on a quick orientation walk around the property. 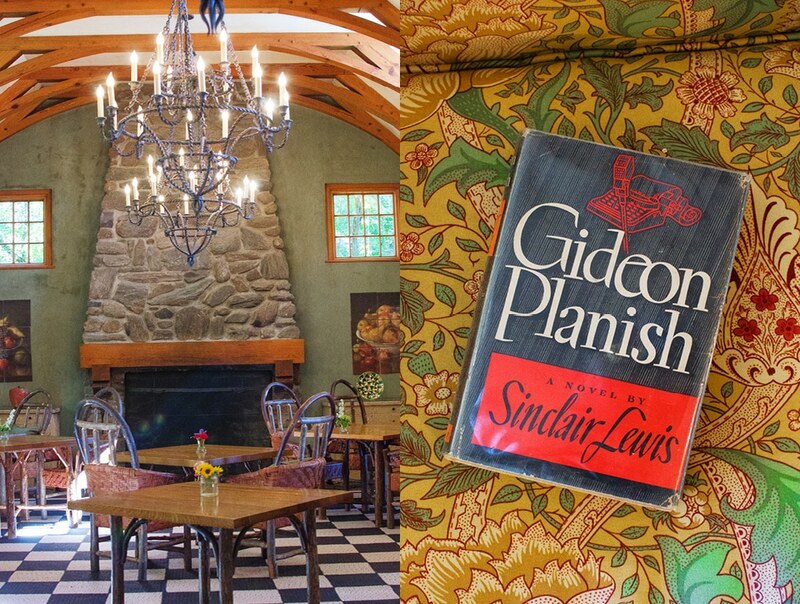 The story of Twin Farms begins with Nobel Prize winner Sinclair Lewis, and his equally famous second wife, author Dorothy Thompson. The story goes that Dorothy conditioned acceptance of Sinclair’s proposal on his providing them with a farm in Vermont. Sinclair was all too happy to oblige and sealed the deal with the purchase of an 18th century farmhouse, now called Twin Farms. This is the place they would call home for the span of their 14-year marriage. Twin Farms was then acquired by the Twigg-Smith family. The Twigg-Smiths hail from the Hawaiian Islands, and were looking for a mainland country outpost for holidays and entertaining, and Twin Farms fit the bill to a tee. It was the perfect counterpoint to the equally idyllic but considerably warmer climes of Hawaii. Evidently, Hawaii proved difficult to get away from and visits to Twin Farms were fewer than hoped. 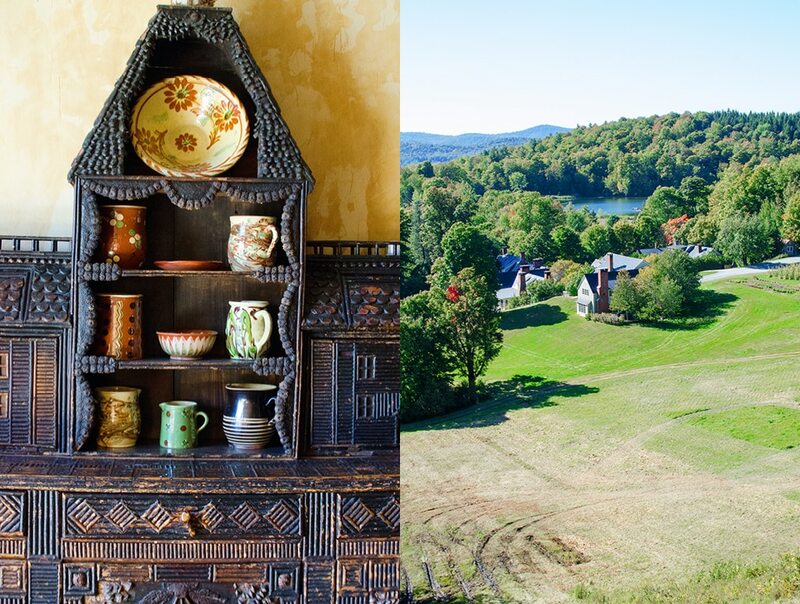 With all that Vermont beauty sitting idle for much of the year a plan was hatched to share their 300 acres of unspoiled countryside with the public. 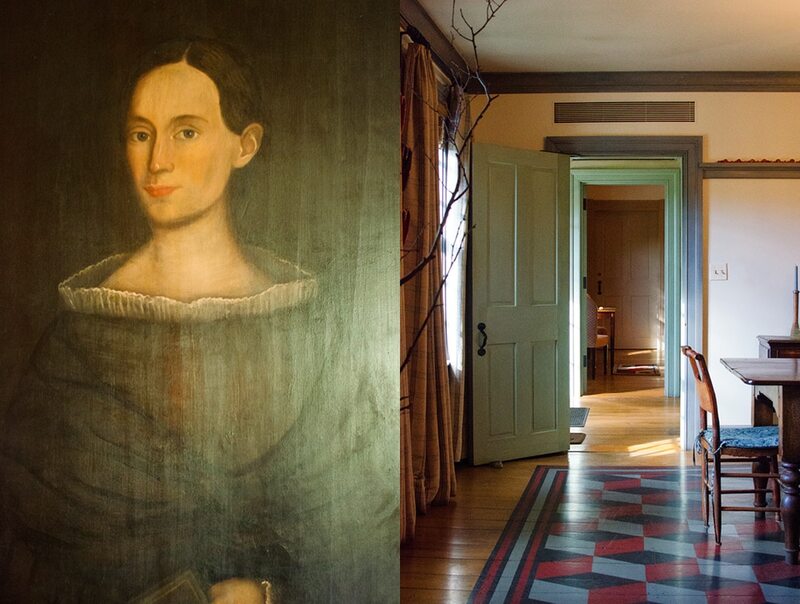 This kicked off a long-term project to gradually add additional accommodations for guests to the original 18th century farm house, while still maintaining the farm’s quiet, low-key country ethos. Accommodation has now expanded to twenty rooms, five in the main house and fifteen other cottages scattered around the property. Situated brilliantly so they are completely private, the cottages are scattered within easy walking distance of the main house. The atmosphere at the farm is very laid back, never stuffy. The staff go out of their way to make your stay better than you had expected. 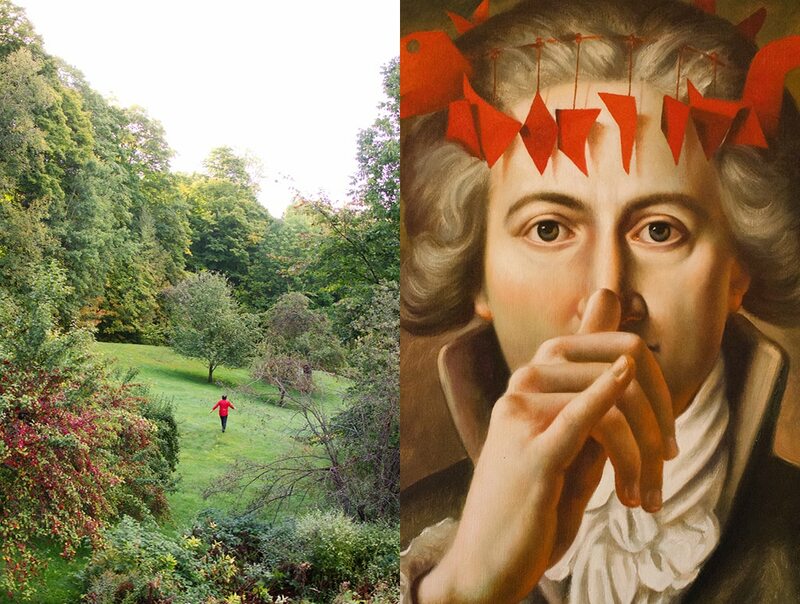 And there is so much to do at Twin Farms that each guest’s experience can be unique. Interested in bees? They can show you their own beehives. 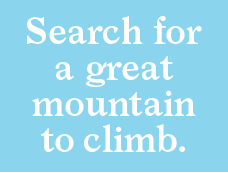 Want to take a hike? A variety of trails start at the main house. In winter Twin Farms has its own slopes to ski and pond to skate on. 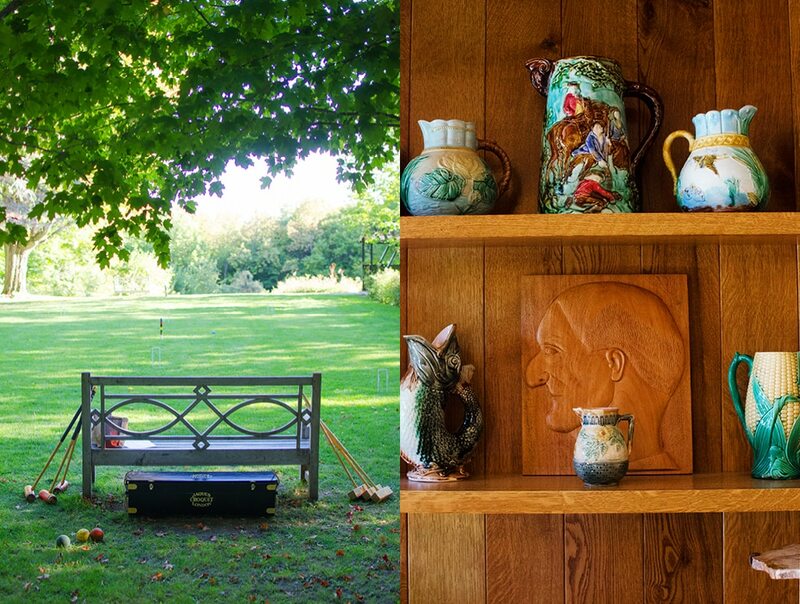 Whether it be croquet, tennis, fly fishing, kayaking, yoga or a spa treatment, Twin Farms can arrange it for you. Anything else you would like? Just let the staff know and they will do their best to make it happen. 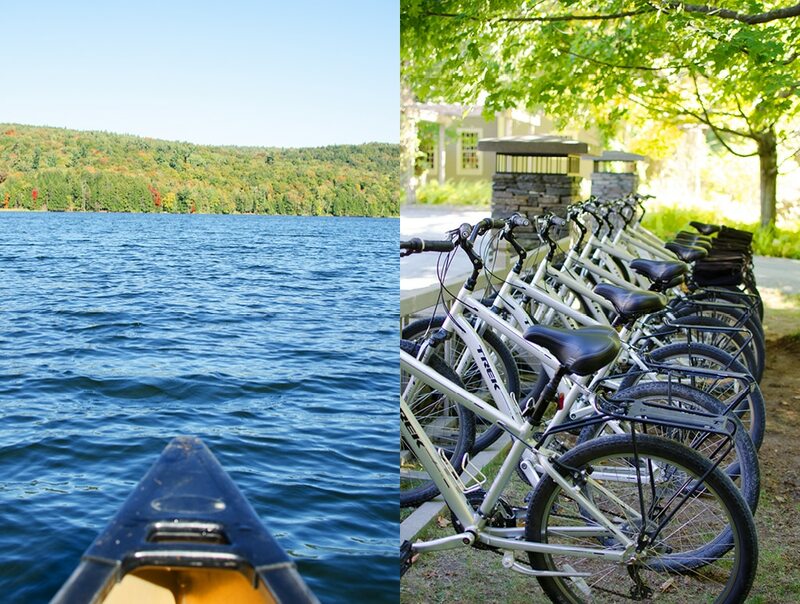 We had an idea that some biking and canoeing would be fun. Bikes shortly appeared with directions to a nice little lake about a mile from main house. We had the whole lake to ourselves that morning. It was a great way to work up a good appetite for lunch. Twin Farm’s handy pre-arrival questionnaire means that by the time you check in the staff already knows most of what they need to make your stay run smoothly. Have any food preferences? By the time you sit down for your first meal the kitchen will already have been alerted and taken care of your requests. 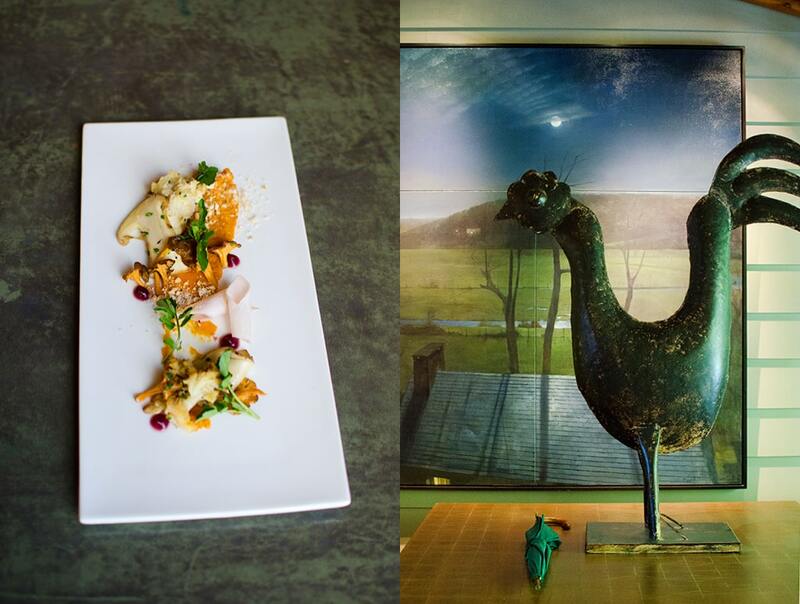 The food at Twin Farms is bountiful and artfully prepared. 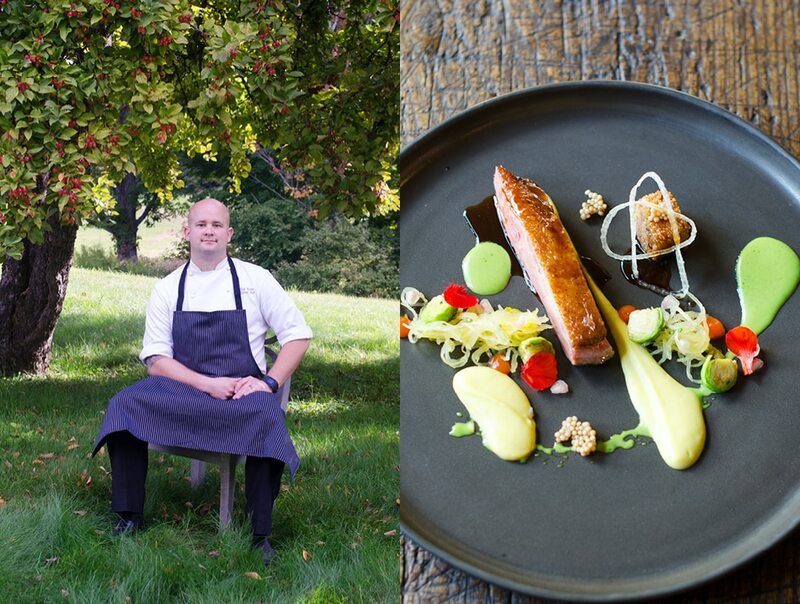 Chef Nathan Rich’s menu of seasonal, locally sourced dishes changes daily. Our first lunch was a fabulous mushroom dish featuring a variety of local fresh-picked fungi. And some of the food is sourced REALLY close by. Chef Rich maintains a kitchen garden that supplies fresh herbs and some other seasonal goodies. Be sure to stroll through the garden for a look at what may be part of Chef Rich’s next extravaganza. 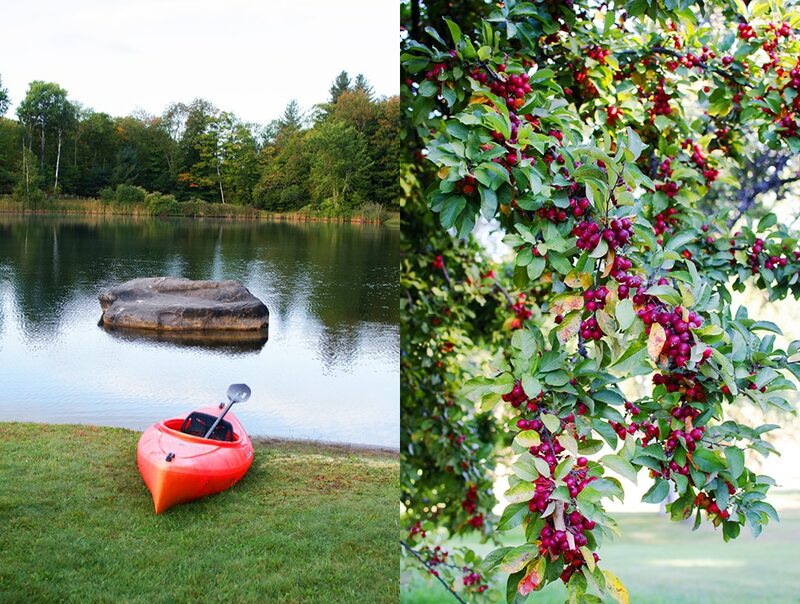 Instead of eating in the house dining room, you can picnic at one of the many scenic spots around Twin Farms. Have the kitchen make up a basket for you and dine al fresco while enjoying the magnificent view. Fun side note: The trailhead for many of Twin Farms hikes is on the old Connecticut postal road which runs right through the property. This trail was also used in the Revolutionary War by, amongst others, General Lafayette to make his way up through the colonies. The trail passes just a few steps from Twin Farms original 18th century front door, which had us wondering if the General might have had occasion to stop in for a rest, or maybe a meal! 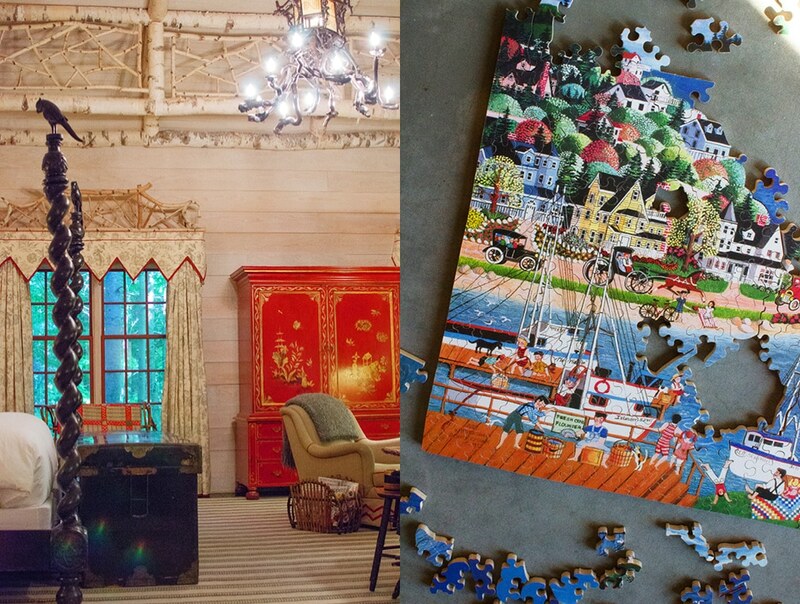 In the living room we noticed a beautiful half-finished wooden picture puzzle with a note attached saying “do not remove”. It seemed someone had a serious project going on there! After trying our hand at the infectious pursuit we discovered that a local company, Stave Puzzles, makes them, each piece of the puzzles meticulously cut by hand. It is unbelievably precise work. 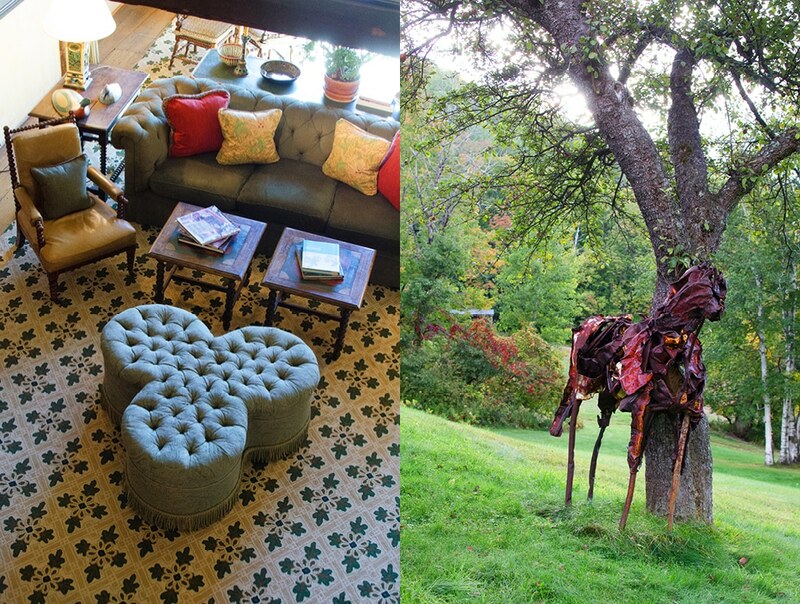 Along with the food and the puzzles, a lot of what you see at Twin Farms is locally sourced. 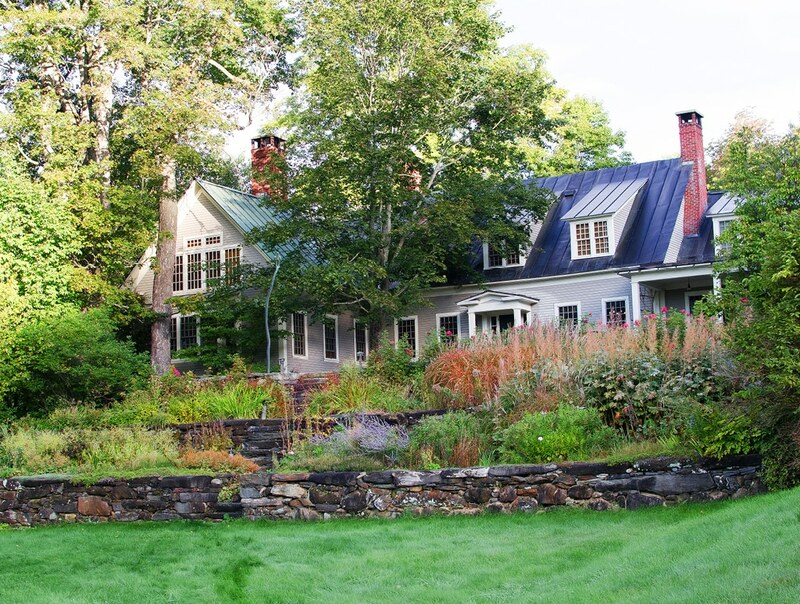 A notable example is the glassware and dinner service by renowned Vermont artisan Simon Pearce. Many of these items were designed specifically for Twin Farms. 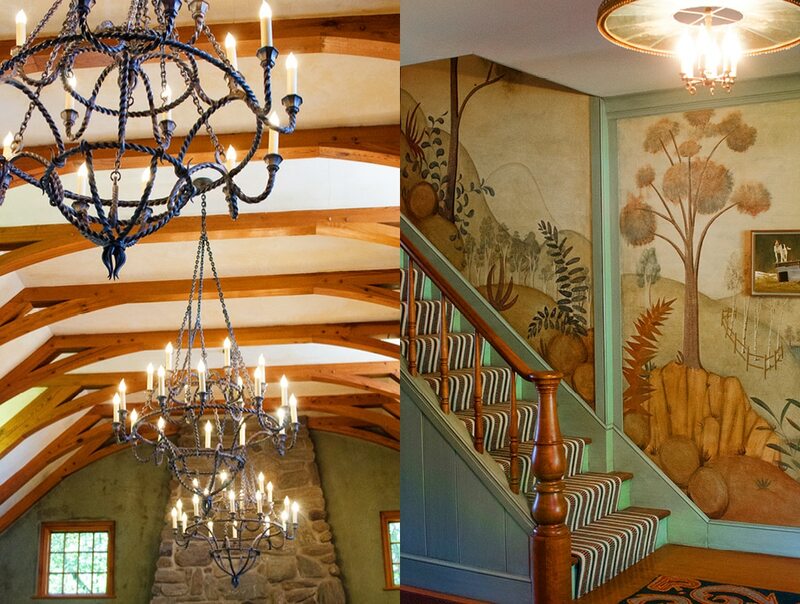 They are a great new addition, by the current custodians of Twin Farms, to the interior that has constantly evolved over some 300 years. 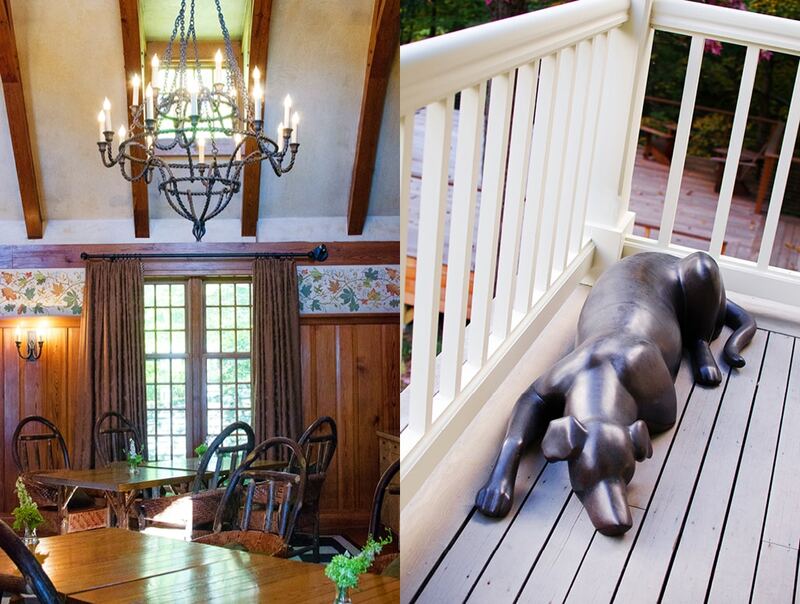 Staying at Twin Farms is very much like visiting a friend’s country home. One of the things I like about visiting friends is seeing the art and objects they collect and use to decorate their homes. Each piece is a memento of a past experience or connection with someone special. Hotels may have art but it is just not the same. The stories behind the art are missing. 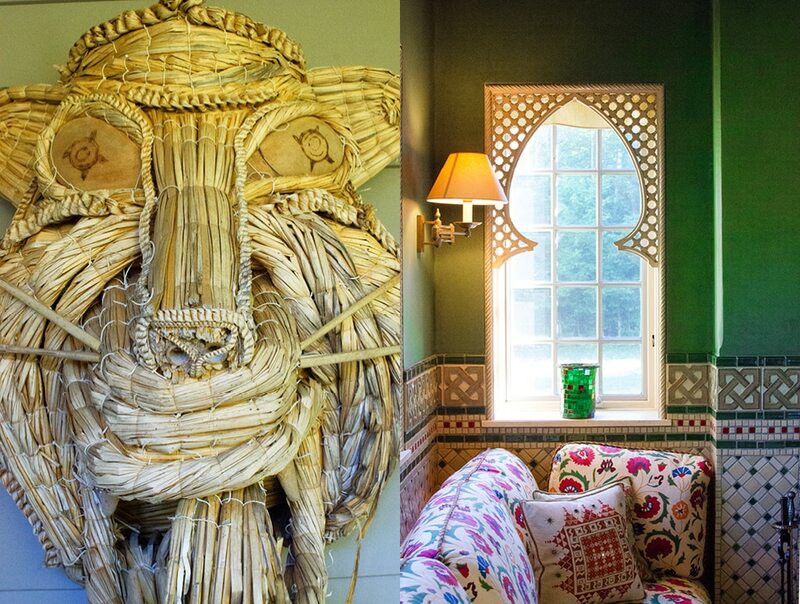 The Twigg-Smiths have an eclectic and fascinating collection. 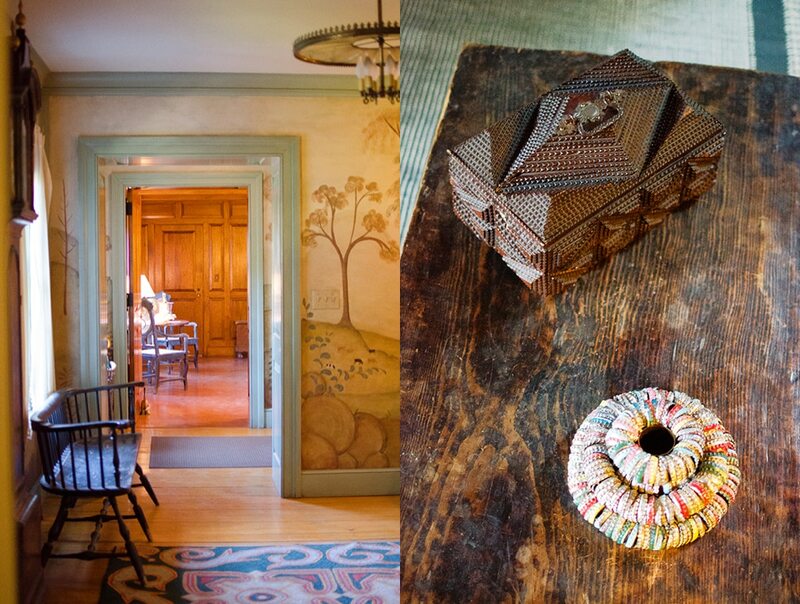 Throughout the property you stumble across works by artists like Hockney, Ruscha, Johns, Twombly, Butterfield, Stella, Dine, to name a few, and other pieces from less famous or unknown origins that are appreciated purely for their curious form or unique character. The staff know many of the stories behind the works so don’t hesitate to ask about anything that takes your fancy. I am sure the piece will be even more intriguing once you know the story behind it. Another thing the Twigg-Smiths brought back from their travels was the Japanese bathing tradition of Furo or Ofuro. 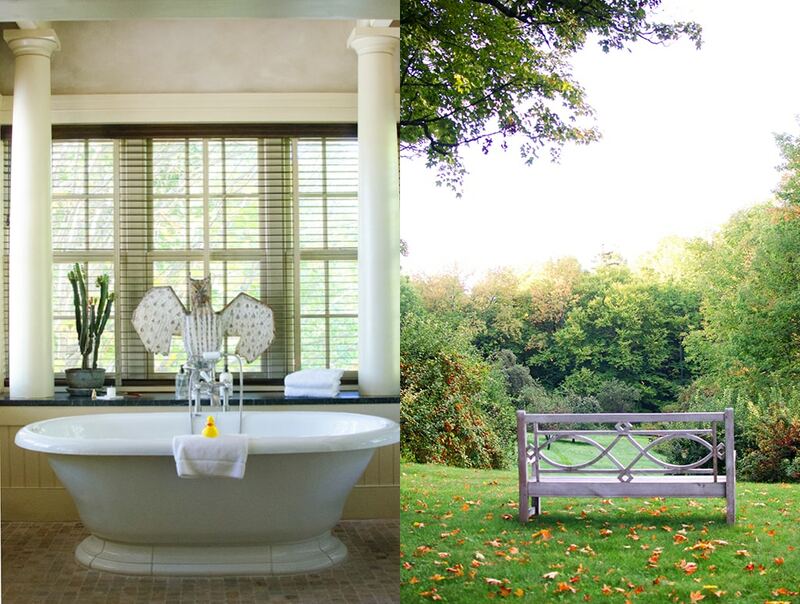 Constructed on the property is a working bath house with water perfectly heated to the traditional 38 degrees. As is the Japanese way, au naturel bathing is at your option, so another very important tradition has been developed at Twin Farms. A towel hung on the door means the bath is occupied so you can relax in your pristine state with no fear of being disturbed. Emerging from a few hot plunges in the bath with ice cold dousings in-between we felt as relaxed as if we had been on holiday for a few weeks! With the sun setting over the distant horizon we settled into some Adirondack chairs on the terrace and enjoyed a before-dinner drink. The air was crisp but the crackling open fire kept us warm. Dinner is served, so we move indoors to the dining room. 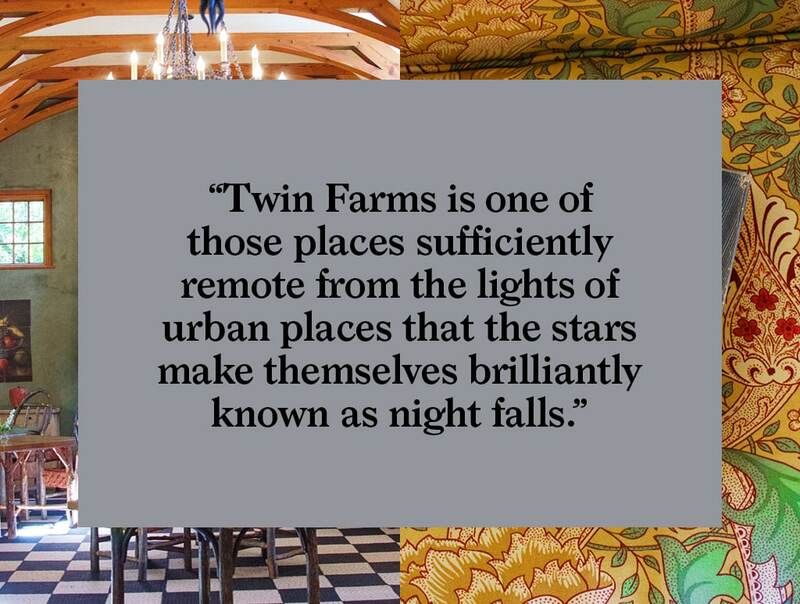 Twin Farms is one of those places sufficiently remote from the lights of urban places that the stars make themselves brilliantly known as night falls. When in the country simple things take the fore with spectacular effect. And on this night in particular we were given a rare treat, a full lunar eclipse with a blood moon. A telescope was organized and along with the other guests we enjoyed nature’s full nighttime splendor. The next morning after a hearty breakfast, sadly, it was time for us say goodbye. The kitchen sent us on our way with a lovely packed lunch for the trip home. 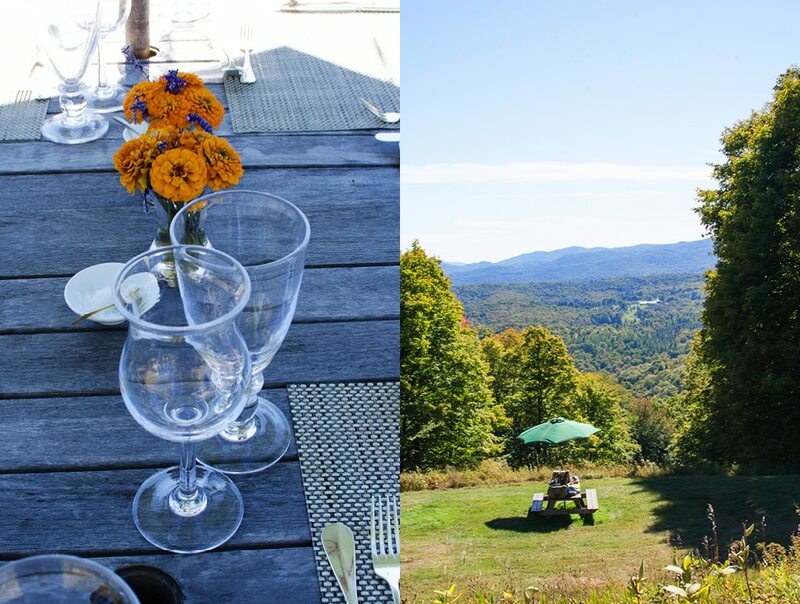 Driving back through the rolling hills of Vermont we stopped in a small town, enjoyed our lunch and recalled our amazing few days at the very special Twin Farms. Planning a trip to Twin Farms? Here is the current weather and what to expect for the next few days.